A leader does not become one overnight. He must be tested first. He must undergo the preparations of God, which both break and strengthen. Moreover, the more he wants to be used by God as a leader, the more he must submit to the deeper dealings of God in his life. This goes against our culture, which wants instant success. We want to start at “the top,” but that is not the way of God. The following story1 is an excellent illustration of the preparation process of God. On a dirt road in the middle of a wide field stood a beautiful carriage, something on the order of a stagecoach but all edged in gold and with beautiful carvings. It was pulled by six large chestnut horses: two in the lead, two in the middle and two in the rear. But they were not moving, they were not pulling the carriage, and I wondered why. Then I saw the driver underneath the carriage on the ground on his back just behind the last two horses’ heels working on something between the front wheels on the carriage. I thought, “My, he is in a dangerous place; for if one of those horses kicked or stepped back, they could kill him, or if they decided to go forward, or got frightened somehow, they would pull the carriage right over him.” But he didn’t seem afraid for he knew that those horses were disciplined and would not move till he told them to move. The horses were not stamping their feet nor acting restless, and though there were bells on their feet, the bells were not tinkling. There were pom-poms on their harness over their heads but the pom-poms were not moving. They were simply standing still and quiet waiting for the voice of the Master. As I watched the harnessed horses I noticed two young colts coming out of the open field and they approached the carriage and seemed to say to the horses: “Come and play with us, we have many fine games, we will race with you, come catch us.” And with that the colts kicked up their heels flicked their tails and raced across the open field. But when they looked back and saw the horses were not following they were puzzled. They knew nothing of the harnesses and could not understand why the horses did not want to play. So they called to them: “Why do you not race with us? Are you tired? Are you too weak? Do you not have strength to run? You are much too solemn, you need more joy in life.” But the horses answered not a word nor did they stamp their feet or toss their heads. But they stood, quiet and still, waiting for the voice of the Master. Again the colts called to them: “Why do you stand so in the hot sun? Come over here in the shade of this nice tree. See how green the grass is? You must be hungry, come and feed with us, it is so green and so good. You look thirsty, come drink of one of our many streams of cool, clear water.” But the horses answered them not so much as a glance but stood still waiting for the command to go forward with the King. And then the scene changed and I saw lariat nooses fall around the necks of the two colts and they were led off to the Master’s corral for training and discipline. How sad they were as the lovely green fields disappeared and they were put into the confinement of the corral with its brown dirt and high fence. The colts ran from fence to fence seeking freedom but found that they were confined to this place of training. And then the Trainer began to work on them with His whip and His bridle. What a death for those who had been all their lives accustomed to such a freedom! They could not understand the reason for this torture, this terrible discipline. What crime had they done to deserve this? Little did they know of the responsibility that was to be theirs when they had submitted to the discipline, learned to perfectly obey the Master and finished their training. All they knew was that this processing was the most horrible thing they had ever known. One of the colts rebelled under the training and said, “This is not for me. I like my freedom, my green hills, my flowing streams of fresh water. I will not take any more of this confinement, this terrible training.” So he found a way out, jumped the fence and ran happily back to the meadows of grass. I was astonished that the Master let him go and went not after him. But He devoted His attention to the remaining colt. This colt, though he had the same opportunity to escape, decided to submit his own will and learn the ways of the Master. The training got harder than ever but he was rapidly learning more and more how to obey the slightest wish of the Master and to respond to even the quietness of His voice. And I saw that had there been no training, no testing, there would have been neither submission nor rebellion from either of the colts. For in the field they did not have the choice to rebel or submit, they were sinless in their innocence. But when brought to the place of testing and training and discipline, then was made manifest the obedience of one and the rebellion of the other. And though it seemed safer not to come to the place of discipline because of the risk of being found rebellious, yet I saw that without this there could be no sharing of His glory, no Sonship. Finally this period of training was over. Was he now rewarded with his freedom and sent back to the fields? Oh no. But a greater confinement than ever now took place as a harness dropped about his shoulders. Now he found there was not even the freedom to run about the small corral for in the harness he could only move where and when his Master spoke. And unless the Master spoke he stood still. And with this the Lord made me to know that in the day when people are weak and famished in their spirits in the time of spiritual famine that those who have lost their own wills and have come into the secret place of the most High into the utter confinement of His perfect will shall have plenty of the corn of Heaven and a never ending flow of fresh streams of revelation by His Spirit. 1 The Harness of the Lord by Bill Britton. This month’s recommended web site is Bible Study Tools on Crosswalk.com. Online Bibles, Commentaries, concordances, lexicons, histories, etc. Very useful! 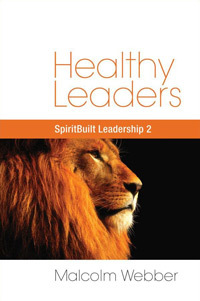 This month’s recommended book is SpiritBuilt Leadership #1 – Leadership by Malcolm Webber. The first in a series of books about many aspects of leadership, this book deals with the nature of leadership, servant leadership and other basic issues. A simple and clear book that will help leaders understand what they’re doing and be more effective.